We all know the importance of recycling – whether at home, at work, or when out and about, it’s everyone’s responsibility to reduce the amount of waste that is sent to landfill. According to UK Government statistics, less than half of all waste generated in the UK is recycled. However, in order for us to recycle properly there must be suitable recycling facilities at hand. Most of us have recycling bins at home, but in the workplace, they aren’t always available. For businesses that are looking for ways to become more sustainable – as well as reduce business running costs by reducing the amount of waste sent to landfill, according to WRAP – providing recycling facilities such as recycling bins is a must. 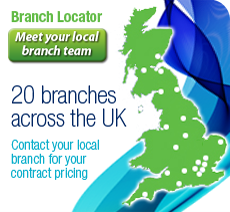 This also requires appointing a recycling waste contractor to collect and dispose of the waste. Many contractors will require that you separate your materials for recycling, and for this, colour coded bins can be really helpful. 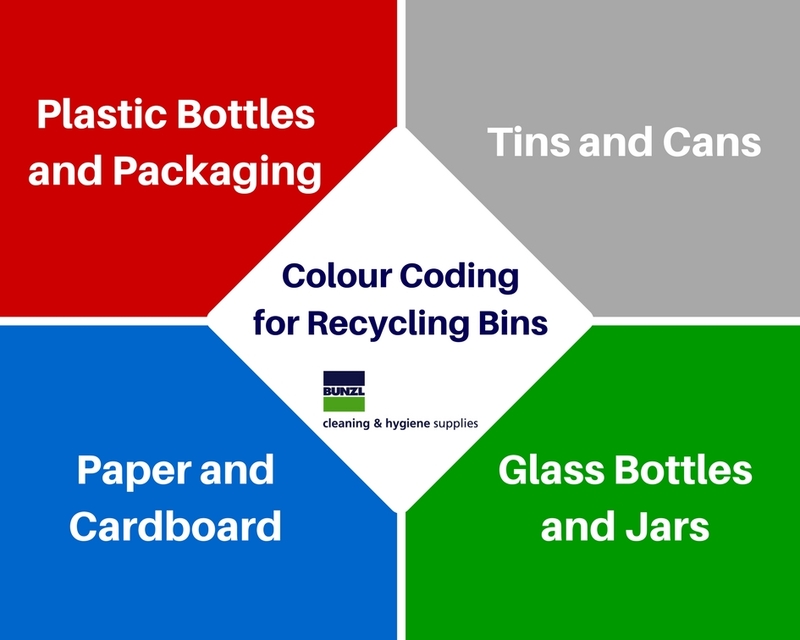 Below we’ll take a look at what materials could be recycled in your business, and how colour coded bins can make recycling easy for you and your staff. Your appointed waste management company will be able to tell you exactly what you will and won’t be able to recycle with them, and what materials may need to be sent to a local authority recycling facility or handled separately. For example, not all recycling companies will accept shredded paper, so you may need to use a confidential recycling service if you need to dispose of a large quantity of sensitive documents. If you’re unsure, the RecycleNow website has a comprehensive list of some of the most common waste items, and what to do with them. It’s estimated that an average of 16 million plastic bottles are used but not recycled every day in the UK, and most types of cans are recyclable, but did you know that it’s even possible to recycle batteries, corporate workwear and some electrical items too? However, whilst the list of waste products that can be recycled is extensive, there are many surprising items that are not suitable for recycling. These include sticky notes and paper that is dirty or stained, laminated foil pouches and crisp packets, and drinking glasses – so it’s really important that you make it clear to your staff exactly what can and can’t be placed in recycling bins to ensure that your efforts aren’t thwarted by contaminated waste. If you are required to separate your waste, colour coded bins for waste management make it easy as they clearly distinguish which bins are used for each type of waste item. At Bunzl Cleaning & Hygiene Supplies we have an extensive range of colour coded recycling bins and lids from brands such as Vileda Professional and Rubbermaid, whose Slim Jim Recycling System is perfect for smaller offices and workspaces – so there’s no excuse for not recycling, whatever the size of your business! However, for the general waste that you cannot recycle, why not line your bins with The Green Sack – a sturdy black refuse disposal sack that is made from 100% recycled waste plastics, so you can continue your commitment to making your business more environmentally-friendly, simply by changing your bin bags. If you’re interested in other ways to become more sustainable in your business, read about easy and budget-friendly steps that you can take to create a ‘greener’ workplace, and the benefits of biological cleaning products and bamboo toilet tissue. Do you use colour coded recycling bins in your workplace? Let us know which colours you use by leaving us a comment below, or tweet us @BunzlCleaning.